February isn’t, generally speaking, the most conducive time of year to go roaming the woods or immerse yourself in the great outdoors. With its cold rains, claggy mud, bare trees, muted colours and short daylight hours, it is a month marked by dormancy for many, although still one in which the early green shoots and nascent buds are at least appearing to signal some sort of an end to another grey and dreary English winter. 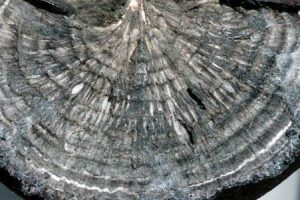 With the fleshier varieties of fungi, much of the dramatic flushes of just a few months ago have long died and rotted back into their substrates. However, there are a few more durable species that persist around the year, although generally ones that tend to be overlooked because they are so ubiquitous, inedible, and, at first glance at least, not particularly interesting. 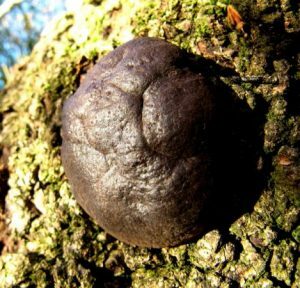 A typical example is Daldinia concentrica, whose hard, black tumescent growths have earned them the common names of King Alfred’s Cakes, Carbon balls or Coal fungus. As described in a previous blog post, these were in older times used as firelighters. People used to carry them in their pockets to ward off cramp too, a habit that earned them the alternate common name of Cramp Balls, although there’s no scientific evidence they actual do have any benefit in the health department. 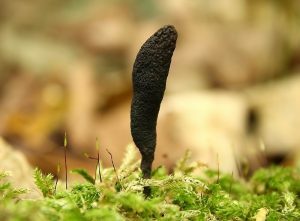 Their dark, woody fruiting bodies are a long time in the growing. They initially emerge in the summer months, initially appearing rusty brown and getting bigger and bigger (up to about 6cm across) before turning black and drying out to release spores from their outer skin. Every season they develop a new layer of this spore-releasing surface, so that when cut in half, you can see the concentric rings, like a tree, representing each new fresh wave of growth (hence the specific epithet concentrica in the latin name). Sometimes, after several years, the individual swellings might fuse together. Few animals are likely to chomp on these crunchy, dry lumps, although their tough black carapaces do provide a home for certain insects to hide away within (and a few tiny critters have been recorded to eat its spores too). Nevertheless, even when they have outlasted their reproductive function, these commonly spotted canker-like growths can endure for many years on the dead parts of broad-leaved trees (usually ash). 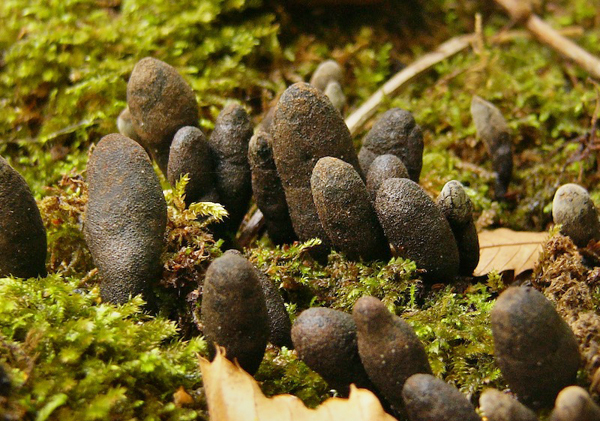 King Alfred’s Cakes belong to the Xylaria genus of fungi, referring to those species that grow on wood (xylem being derived from the Greek for “wood”). In this instance, their hyphal networks grow within the tree and result in a brown rot. That is, they decompose the cellulose in the wood, unlike white rot, which decomposes the lignin. 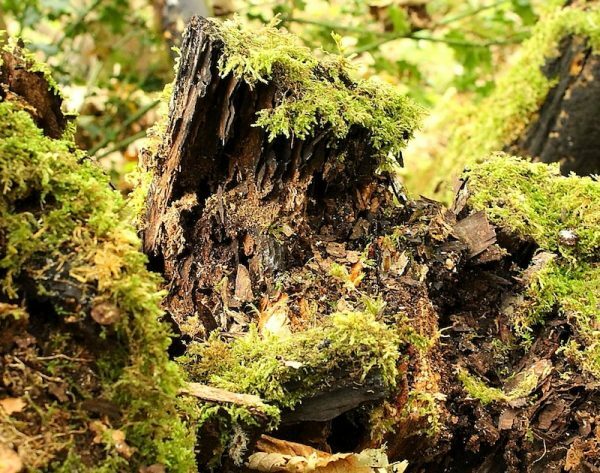 What is left is a dead brown woody pulp that in itself caters for the nutritional needs of other fungi in the vicinity, insects, grubs, slugs, slime moulds, bacteria and a host of organisms involved with decomposing organic matter. 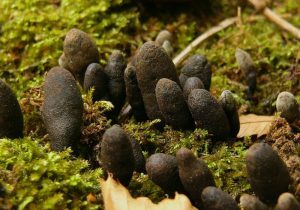 One assumes that the rather morbid common name for Xylaria polymorpha, Dead Man’s Fingers, at least partly stems from this association with decay, and not just from its sinister, protruding fruiting bodies, which reach up to about 10cm in height. Either way, like King Alfred’s Cakes, it causes no harm to living trees, and research in Asia has also demonstrated that certain chemical compounds produced by this fungi have strong antifungal properties (link to PDF) that inhibit the growth of pathogenic fungi that might otherwise blight forest flora. The polymorpha component of the latin name means “many forms”, and indeed, the fruiting bodies do take many forms. In fact, if one were to get down to the level of genetic sequencing, it seems even this precise latin name would encompass about a dozen visually indistinguishable species. 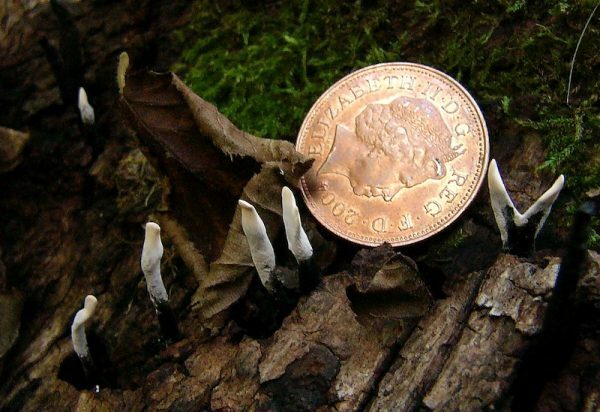 However there is one variant, whose longer, more stalk-like fruiting bodies, smaller spores and tendency to grow singly rather than in clumps, are sufficiently discernible to warrant not only a different latin name Xylaria longipes, but an english one too: Dead Moll’s Fingers. The french are even more colourful with their language, referring to it as “le pénis de bois mort”. There are hundreds of species in the Xylaria genus, differentiated by geographical range, climate, habitat and associations with specific trees as well as by macro- and microscopic features. Certainly your average fungi identification book are likely to list only the handful of most common or distinctive ones. 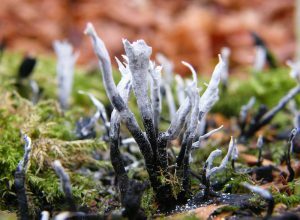 For the purposes of the layman, a main division is between the bigger more bulbous types and the much smaller and brittler antler-shaped ones, of which the most representative in the United Kingdom is the Candlesnuff Fungus (Xylaria hypoxylon). 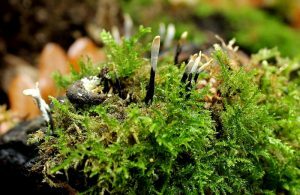 We should add that even amongst this second category there are hundreds of subtle variants, such as the Beechmast Candlesnuff (Xylaria carpophila), which only grows on the outers shells of fallen beech nuts. O’Reilly describes the name Candlesnuff Fungus as “something of an enigma”, although it seems a fairly obvious description. 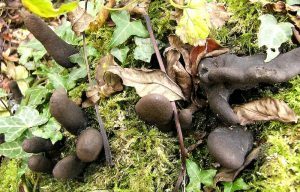 The black fruiting bodies have a grey to powdery white coating across the top branches right to the tips which, as Shelley Evans and Geoffrey Kibby point out in their Pocket Nature: Fungi (2004) guide, resemble “a snuffed out candle-wick”. 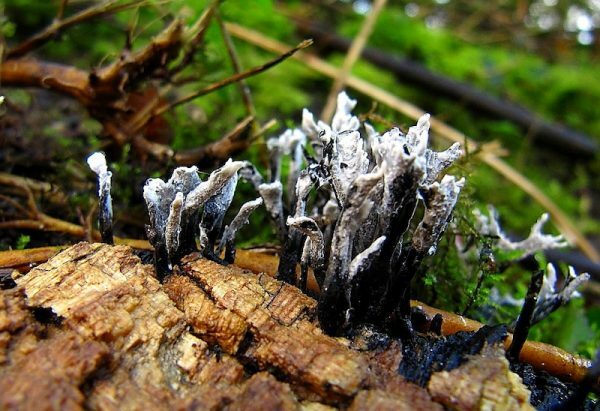 It seems there is a second reason behind the common name, in that Xylaria hypoxylon has also been described as bioluminescent, due to phosphorus accumulated in its mycelium reacting when exposed to air. In reality, the glow-in-the-dark effect for this particular species is considered very limited indeed. Even if one does happen to be in a woodland environment surrounded by Candlesnuff at the dead of night, it is highly unlikely you’ll detect anything at all, unless you happen to be pointing a camera in the right direction and leaving it on a very, very long exposure.